First off, to TJ, I apologize for not putting up a post about the stairs up to the deck being completed yesterday. It was a busy day and we ended up having some 'company' visit in the evening. First off, yesterday morning's project went much better than the previous morning's of taking down the trees. We try to pick the most strenuous project to complete in early morning before it gets too hot. For yesterday, that was building our stairs up to the deck so we would no longer need to use a step ladder every time we came and left the house. The house is built on land that slopes a bit so the stairs at the front needed eight steps while the ones at the back will have six. We decided to conquer the longest first, plus their location gives us easiest access to both the back door which goes in through the laundry room and the French doors which lead into the kitchen. We had this project completed before the temperature reached 90! We then started the project of wiring the house with a 12V DC system. We had hopes to use some of the existing wiring to various overhead light fixtures and outlets and connect them into the 12V system we set up with the golf cart batteries. But when the house was vandalized, all the wiring was cut and most of it was pulled out of the walls. Alan commented that it was frustrating knowing all that wiring had been done but that we did not have access to it now. But he then added that is if it had not been vandalized, we would have never been able to buy the property because it would have been way out of our price range. The vandalism that had occurred caused the bank to drastically drop the price, selling it as property only with the house having 'no value'. I responded that where most people would consider it of 'no value' and a lot of work, we were probably the only ones that looked at it considered it to be much more than we ever expected to be able to get for what we were planning.We started this adventure just looking for vacant land to put a camper on! One of our Friday night visitors. Sorry, I am sort of rambling, I will post more about the electrical project when we complete a bit more and I take some pictures. For now, back to yesterday. We went out for a bit again yesterday afternoon. We do not plan to have to run errands every day, but in the heat wave we have been experiencing it is nice to get out of the house during the hottest part of the day, so if we have errands to run, we schedule them for the afternoon. We came back in the early evening, I am once again admiring our steps and I here a noise towards the north end of our property that sounds like something rustling in the woods, I turn and there is a horse walking out of our woods, followed by another horse, and another, and another. They all have halters on and must belong to one of our neighbors. They walk along our drive way and start meandering up the road in front of our house. I try to get close to them, thinking if I can catch the leader the others might hang around and we could go ask the closest neighbor if they know who owns them. We think they are from the pasture that is the next property down the road. But, as I get close to them they turn around and head down the road in the other direction. There was no way I was going to be able to catch them and they were heading back home, so I guess the just stopped by to say 'Hey!' or would that be 'Neigh!' and left some road apples in our yard as a house warming gift. you didn't have to leave the road apples! Gee, all that and I haven't even gotten to the entertainment I refer to in the title of this post. This morning we decided we had made a lot of progress over the last few days and we could take a break. 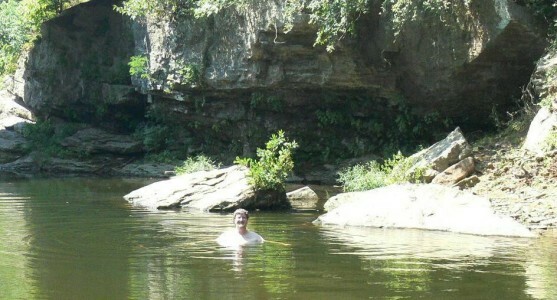 First item on the 'time for fun' agenda was to try out one of the local swimming holes. There is one at the end of our road that we have seen people at, so we decided to start there. We have stopped at a couple different swimming holes in a nearby town that are popular to check them out, but we liked the thought of this nearby swimming hole being the first we actually dipped our toes into. We made a good choice! As soon as Alan stepped in he said "Oh, you're going to like this." That made me smile because I knew that probably meant the water was not too cold. While he has always had aspiration to join a 'Polar Bear Club' and dive into Lake Michigan on New Year's Day, and he has actually gone swimming in Wisconsin lakes during late October camping trips, I tend to be a 'hot tub only' kind of 'swimmer'. But the water was great, and even though it has been a hot, dry summer, there was still an area that was deep enough to be over your head, not that I ventured over there. I did not venture quite so deep. Our next entertainment of the day was sort of spur of the moment. 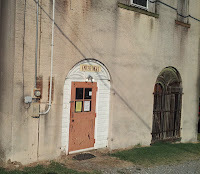 We had seen a rather dilapidated building in a nearby town that advertised live entertainment every Saturday night. We googled it a while back and thought it sounded interesting. Neither of us are country music fans, but several years ago, while visiting nearby Branson, we went to the 'Sons of the Pioneers' show which precedes the Shepherd of the Hills play and enjoyed it immensely. 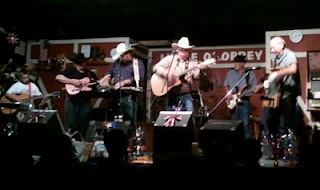 It was more Country Western with a lot of the old-time cowboy songs and was more fun than we expected. This sounded like it would be similar with local talent. It turned out to be great, and quaint at the same time. When we went in to buy our tickets, we were told tonight's show included a free ice cream social before the show started. We had already decided to eat across the road at a little food trailer that had become a permanent fixture in the town. We ate there once before and enjoyed it. I don't think this place has a name, it is basically one of the food concession trailers you would see at a fair. On our first visit we were impressed with the cleanliness and variety of the menu. Tonight we shared a steak basket (deep fried steak strips with fries), deep fried ravioli and deep fried broccoli. OK, I didn't have to share the broccoli with Alan as he claims he is chlorophyll intolerant. After dinner, we returned to the 'theater' and grab some dessert before taking our seats, the place is almost filled to capacity. The show was quite good and it varies each week. There appears to be a 'house' band, then multiple guest acts perform with them each week. This week the guests were mainly young local artists that performed more contemporary numbers like songs from Martina McBride, Alabama, and Luke Bryan (I had to google that one to see who sings the 'speakers go boom boom' song - gotta love google when searching for answers to things you actually don't know the question to). Anyway, besides several upcoming pop country singers, there was also a more 'mountain music' trio that included a gentleman that played both the washboard and spoons that was very entertaining. Remember I said the event was both good and quaint? The quaint was the intermission activity. When we came in, I had noticed the gentleman in front of me in line was carrying a jar candle, then when I sat down I noticed there was a table with an odd assortment of items in front of the stage including the gentleman's candle. It turns out that during the intermission there is a door prize give away with the prizes being whatever people 'in the know' brought with them that night. I can't remember all of tonight's prizes but they included - blackberry jam, chocolate covered cashews, several packages of cookies, Little Debbie brownies, a patchwork pillow and the one I was hoping to win, which was a bag of fresh peaches. The bag was the paper type with the paper handle that you often see at apple orchards, I believe it was a half-peck. I had to giggle when they said they first had to put them in a plastic bag before giving them to the winner as the bottom was 'getting mighty juicy sitting there'. Mounted one solar array (three panels) to the side of the house and wired it into the batteries so we put our first power INTO the batteries. 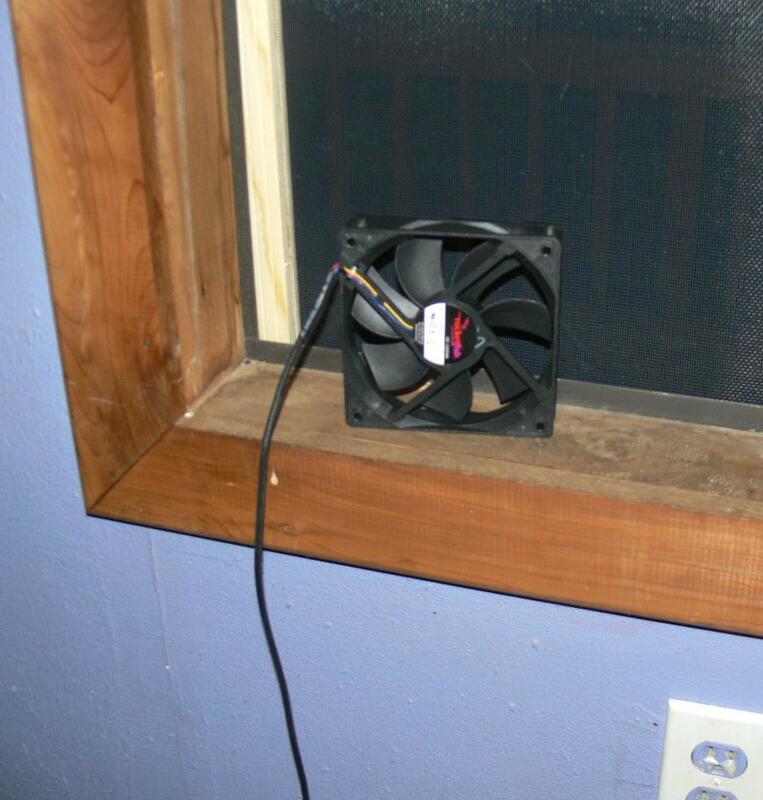 Turned case fans made for computers into small 12V window fans which were a nice addition to the bedroom. You can buy ready made 12 volt fans, but those draw about 42 watts from the batteries, and after much searching Alan found these case fans that only draw 0.2 watts! We attached about 12 feet of wire to the fans and a cigarette lighter adapter so that they can plug into the little case of gel cell batteries that we brought down on the last trip. We thought they were starting to fail but Alan has them working again. I know there were a lot of other odds and ends like unpacking boxes but I guess I need to start writing notes to myself throughout the day to remember everything. We also took some time out to work on client projects and I needed to pack and ship some eBay items. And yes we were still sweating while sitting at our computers. We were not sweating as much. Alan with his USB fan attached to his computer. AND a floor lamp running off our 12V system! We also stopped at the grocery store, came home put things in our fridge and cooked a real dinner for the first time. By the way, when we woke up this morning Alan checked the temperature in the fridge with his infra-red temperature probe and most areas were below freezing so we have been bumping the temperature control up little by little. Looks like it will work great even in the hottest temperatures. I was worried it would only lower the temperature a certain amount below ambient (ie., 40 degrees, so if it were 80 degrees it would be 40 in the fridge but if it were 100 degrees it would only take it down to 60) but that is not the case. We could actually use it as a freezer in these 100+ temps if we wanted to. Assembled second solar panel array on the deck and wired it into the batteries, We want to experiment on panel locations for best sun exposure. 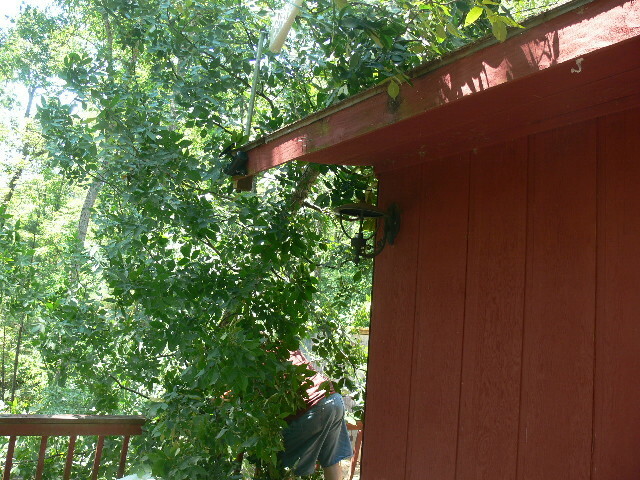 Alan sawing the tree to move it off the house. The directional cellular antenna is still in place in this shot. Cut down two trees that were near the deck and caused shadows on the solar panels at times during the day. Removed the 40 foot tree that fell onto the house. Repaired and remounted the directional antenna that we installed on Tuesday because the tree rolled as we were removing it and sheared the antenna mounts off the roof and snapped the wiring going to the antenna. Installed the utility/laundry sink and plumbed the drain so I can now do a load of laundry which is good because Alan is going through at least three shirts a day. I had broken my keen-style sandals and needed to replace them or wear my work boots all day long, so we decided we could use a break after all that and went to lunch at a Chinese buffet we have been wanting to try. Yes, we managed to do all that before lunch time! I mention this because I want to share Alan's insert in his cookie: "Happiness lies in the joy of achievement and the thrill of creative effort." How apropos after he dropped a tree on the house this morning! We also stopped at Home Depot for some staples for the staple gun because we bought the wrong size on our last trip. I had just checked their 'oops' paint a couple days ago, but figured it would only take a minute to run over to the paint department to see if I could snag another treasure. Score! a gallon of Behr paint in a slightly darker shade than the quart I got for only $7 (normally about $27). I told Alan I need to find a store whose paint mixing employee has poor short term memory and a high 'oops' rating. When we got back home, I did a bit of puttering around while Alan took a short nap thanks to our new fans in the bedroom. Then we needed to make a trip to the spring to fill up our non-potable water bottles. Driving down our road we saw our first live armadillo, I wanted to bring him home. We also saw 7 deer along our road including a momma with two spotted babies. Heading out the road to the spring, I commented that we probably wouldn't see as many deer as it is a pave road. As soon as I said that we came across a field with about 20 deer at one end and another 10 or so in the back corner. There were a few more spotted on the way home but we lost count. It was well over 35 deer spotted in about 15 miles.But that still doesn't beat the 1 live armadillo! It was a good day with some more projects completed but I have a headache tonight, probably from the heat, and I need to get up early to work on a client project. So off to bed without a post... Oh, um , nevermind. Sitting here tonight off grid and I have SoBe Yumberry Pomegranate cooling in the fridge, a decent internet connection and a floor lamp with an LED bulb equivalent to a 65W incadescent version shining over my shoulder. It has been a productive day. We started the day by mounting the directional antenna for our internet. Last night we took some time to determine the direction for the best signal, then this moning we mounted it to a pole which is attached to the roof and then fine tuned the direction before tightening it down. It's not perfect, but it gives us a stronger signal than we had on our previous trip. We are considering taking down a couple small trees to the north of the house which may help boost the signal as well, plus provide some firewood this winter. Our 8-step stringers along with all the treads. The box to the left holds our utility/laundry sink. We then unloaded the lumber we got for stair treads from the truck. 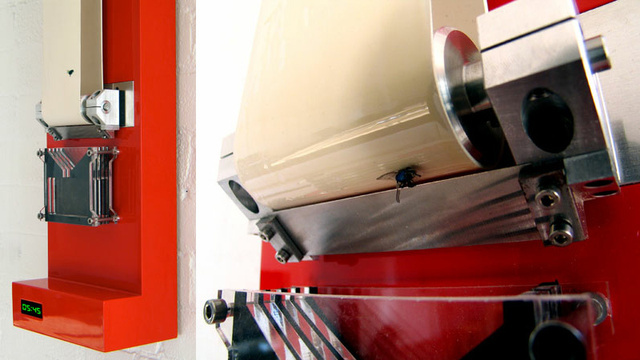 We were originally going to buy six foot length boards and cut them to three foot lengths for each tread. However, we discovered Home Depot did not carry what we wanted in 6 foot lengths, but I was very pleased when they offered to cut the 12 foot lengths they carried into the 3 foot sections at no charge. I had just been hoping to get them to cut them into 6 foot lengths to fit in the truck and then we would saw them in half again at home. I would like to think they offer this service to all their customers as the alternative is that they took pity on us because we are in wandering around the store so much. By the way, while unloading the stringers yesterday Alan and I again had one of interesting 'he said - I thought' communication moments. The stringers are 10 inch by 2 inch lumber with notches cut where the stair treads will go. As these are treated lumber and we have 6 step and 8 step lengths, they can be a bit heavy. Alan started by sliding two stringers part way out of the truck while saying "Can you take two", to which I asked "Together?" His reply- "No, one at a time is fine if you can't carry two." He knew by my look that we were once again saying the same thing but not meaning the same by it. When I asked "Together?" I meant were we both carrying the two he slid out together - him carrying the front and me carrying the back, but he thought I was asking if I should carry the two boards together - me personally carrying two at one time. On to the next project of the day... refrigeration. We actually postponed completing the rest of the battery project in lieu of setting up the propane fridge. We get the fridge into the house, snake the hose through the floor down to where the propane tank goes under the deck and connected the hose to the fridge. By then it was about 11 AM and over 90 degrees. As Home Depot did not sell the larger 40# propane tanks, we still needed to find one. I also needed to do some 'work-work' for a client so we decided to drive into the city, Alan would drop me at Atlanta Bread so I could work for a couple hours without sweating while he went on several errands. When he came back to pick me up he told me he had to pick up a belt while he was in Best Buy because his shorts are now too big. I was surprised Best Buy sold belts, but he assured me it was a very geeky belt and it was even free. We returned home, hooked the propane tank to the fridge and it is now cooling down. While running his errands, Alan also picked up a floor lamp. This might sound confusing at first, since we had previously said we were going to only use 12 volt DC off of our solar system (we have a solar system!). After much searching, Alan found some very bright, very efficient 12 volt DC LED bulbs that have standard light bulb socket bases. These low voltage DC bulbs can therefore be installed into standard lamps. Alan then connected our 12 volt solar system into some of the remaining house wiring, allowing him to simply plug the lamp that contained the LED bulbs into a standard outlet in the house! An outlet that used to have 120 volt AC has been repurposed into a 12 volt DC outlet. This will be a good test to see how much the batteries are drained by the lamp as they are not yet connected to the solar panels for recharging. One last bit of humor from today. While driving into town we had a five minute discussion trying to figure out what day of the week it was. My watch only shows it's the 26th which was no help. So I grabbed Alan's smart phone which was charging while we drove, the main screen said 'June 26'. Several screens later and still no day of the week, they all had month and date - we decided his is a 'not-so-smart' phone. I then dug my phone out of my pruse and wa-la it says 'Tuesday June 26'. I guess off grid is also off-calendar. I'm tired, I'm hot and it is after 10 PM which is past my bed time when we're off grid. But someone requested I post and entry everyday while we're off grid this time. Don't worry, I won't be able to post that often as I am sure I would run out of content, but this one's for you, TJ. 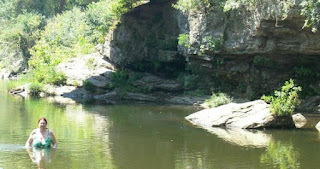 This segment of our off grid adventure started on Saturday when we packed up the truck. I donned the knee protectors and climbed in the back of the truck while Alan started carting boxes from the house. I felt like I was playing a game of tetris with plastic totes and cardboard boxes, but the game was stacked against me (pun intended) by the fact that I started with the stair stringers for the deck as one of the first pieces that had to go in. The three for the front of the deck were over 8 feet long so they had to lay diagonally across the entire length of the bed, meaning I then had to fit lots of square and rectangles in the rest of the truck bed which was now two large right triangles. the fridge and back layer are out. After several repackings we got almost everything to fit, we decided the solar oven could wait until next trip. We get the back of the truck closed, and Alan realizes he fogot the solar panels which were stored in the garage. Since there is Harbor Freight 'near' the property, we decide to leave the ones we have up north for the next trip and buy another set down south on this trip as we will be needing more anyway and we have a coupon. Then, as we are going into the house, I realize we still need to pack our clothes and fit those into the truck somehow. Alan decides we can forgo the 5 gallon potable water container we were taking back down because we left two of them at the property along with several one gallon containers and we have found a close source for potable water at a local park until we get our pump going. Early Sunday morning we hit the road and 'Truck' is proud of his new gear. Alan had taken him for an oil, lube & filter last week and noticed there was quite a bit of 'shimmy' at highway speeds. He told the mechanic the types of roads we were now driving on and asked they check the truck over. He was out of alignment and his tires were in bad shape. So, truck got a new set of larger all-terrain tires and was out of alignment. Oh yeah, he needed new front wheel bearings as well. I don't think Scoot (diesel VB beetle) will get used as much when we bring her down here. We'll save her for when we go out on longer trips, not for jaunts into town, and we will take it very slow on our road until we reach pavement. The drive was not exciting, which is good. Last trip, when we were each driving a vehicle we broke it up into two days, but this time we did it in a single day since we could switch drivers and keep each other company. We always enjoy road trips and have great intellectual discussions along the way. For instance, on this trip some of the topics included 'Do bees in the south have accents and what does it sound like? Bu-uuzz?' Also, 'What do armadillo eat?' We also started a pool as to when we would spot the first road kill armadillo. Alan won, but his guess was still over an hour too late, guess armadillo are heading farther north in the hot weather. Is the house standing - Yes! Is Rodney (the Kia Sportage) still on the drive -Yes! Is the shed door still locked - Yes! Is the solar security lighting still in place - Yes! Is the aluminum 'barricade' we placed inside the French doors still in place - Yes! Get out of Truck and do a little happy dance because everything is how we left it. Now off to bed in our 'quiet' mountain home. Last night at about 8:30 the woods exploded with a cacophony from some kind insects. Alan measured the sounds at 67 decibels. Yes, there is an app for that! Now I want to find an app that will indtify what type of bug is actually making that noise. When our friend read the above title, I am sure there will be a few 'Well, duh!' comments. Throughout our marriage, Alan and I have been involved in various 'people groups' where we never fit the typical demographics. For example, we home schooled our children all the way through grades K-12, but we never fit into any of the stereotypical concepts of a home school family, we never looked like the cover of the homeschooling magazines! Group 1 - Aging Hippies. OK, I admit we are aging, but we have never been hippies. This group averaged about 10 years older than us, the men tended to have distinguished white beards and the women had long gray hair, wear long flowing skirts and Birkenstock sandals. Group 2 - Aspiring Organic Enthusiasts. These were young families consisting of parents (age 25-35) with usually a toddler and a new baby in tow. The parents were all slim and athletic looking. The men pushed baby strollers designed to climb Mount Kilimanjaro and the women wore long skirts and Keen sandals. Also, the food booths catered towards organic, vegetarian meals and fruit smoothies. 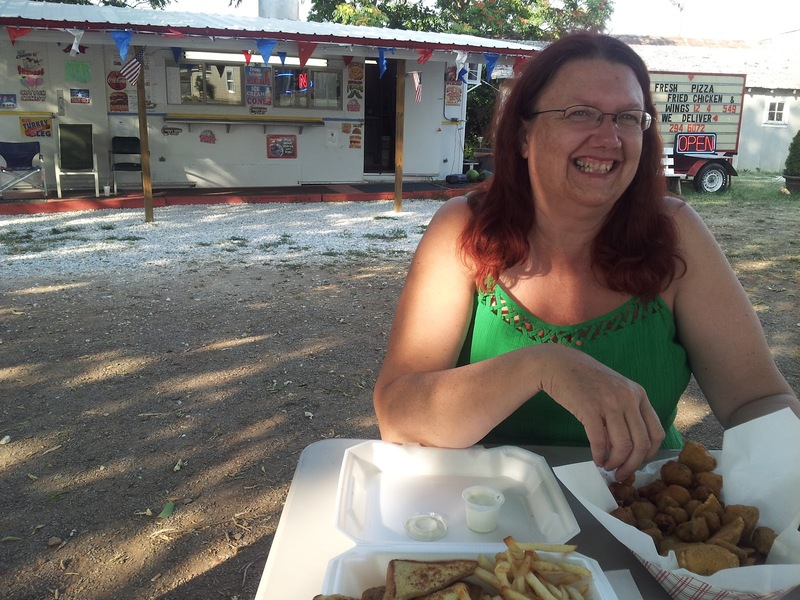 However Alan did managed to find deep-fried cheese curds (we are in Wisconsin). Our main interest in attending were the vendor booths and we were able to pick up a lot of product information on generating power and other off grid topics. The vendors at the event were also an interesting mix. 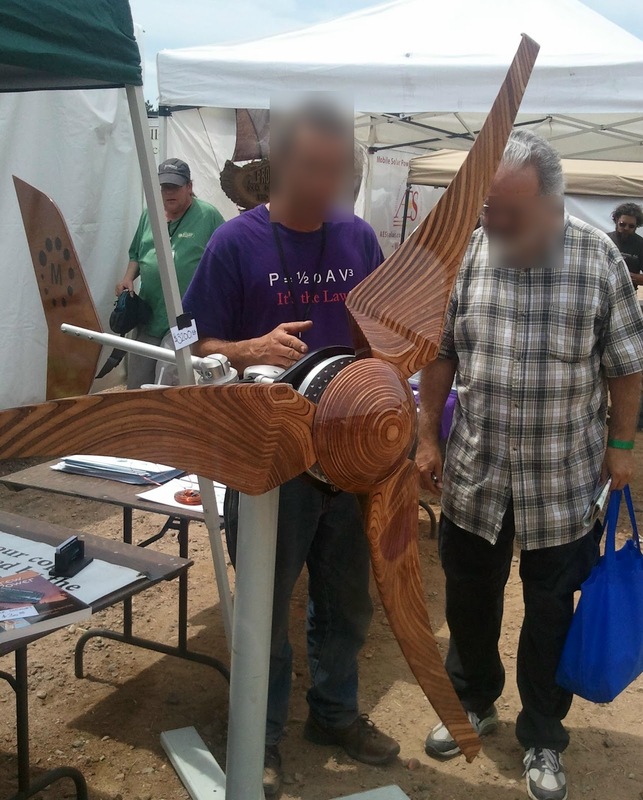 We gravitated towards solar and wind energy products, but a lot of informational and 'shopping' booths were geared towards world peace and saving mother earth. Green was everywhere. The day's experience had me thinking about the wide range of people that constitute off gridders, and of course, we once again do not fit any of the typical stereotypes. We recently found a Wikipedia article that describes the group we may most closely fit into - the Downshifters. According to Wikipedia: Downshifting is a social behavior or trend in which individuals live simpler lives to escape from the rat race of obsessive materialism and to reduce the “stress, overtime, and psychological expense that may accompany it.” It emphasizes finding an improved balance between leisure and work and focusing life goals on personal fulfillment and relationship building instead of the all-consuming pursuit of economic success. 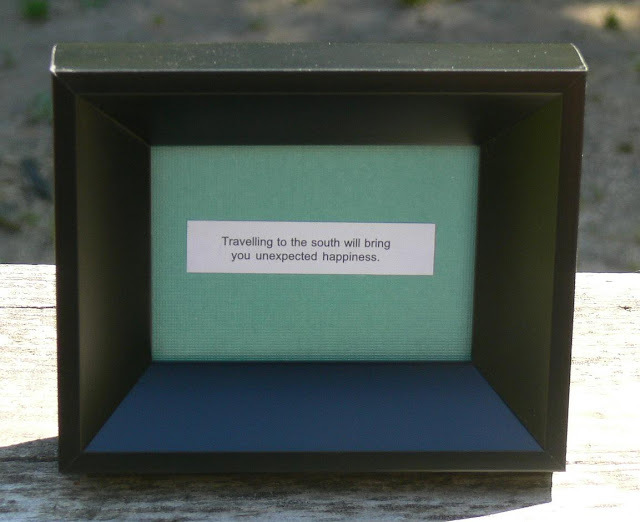 However, we veer away from typical downshifting because it is usually a more gradual change: Downshifting, as a concept, shares many characteristics with Simple living, but is distinguished, as an alternative form, by its focus on moderate change and concentration on an individual comfort level, a “dip your toes in gently” approach. But then, our years of not living a typical suburban lifestyle while living in suburbia could be considered the 'dipping toes' stage for us. While we are not even typical to downshifting, I am going to site a couple more examples based on the Wikipedia article: The primary motivations for downshifting are gaining leisure time, escaping from work-and-spend cycle, and removing the clutter of unnecessary possessions that are accrued while existing in those societies with the highest standards of living and levels of production. Long before I read this, I told Alan my goal in setting up the house on the new property was to make sure everything I bought for it had a purpose. Now, that does not mean everything needs to be utilitarian. One of the first things I purchased was a Calphalon saucepan, I have never had 'good' cookware and I love to cook so I decided I want to have higher quality cookware in my new kitchen. I later laughed when I realized that until we are more established in the house my $75 pan will mainly be used to cook our 50 cent rice meals! On the other hand, we were in a home decorating store and I saw some very cute wire art fish that would look great in my kitchen, There were less than $10, but they served no purpose other than to gather dust, so I did not buy them. If they had hooks to hold keys, or some other useful feature, they would be on my wall right now. Another example is throw rugs ( I admit yet another new addiction), I am planning on painting the existing floors in the house. Wall to wall carpeting is out of the picture as I will not have a vacuum cleaner. I want to use throw rugs as the winter chill may make its way up from the crawl space under the house and I am enjoying shopping for colorful rugs for the various rooms - they serve a purpose and are also fun. WHY we do it: Some people camp only because they want an inexpensive place to sleep while traveling, while others camp for the joy of the camping experience. Likewise, some people move off grid because they feel there is a need to become self-reliant. There is a driving force other than the desire to live off grid for the fun and adventure of it. When I started this blog a couple months ago, I said I was not going to debate the various reasons why people move off grid, so we will leave this analogy at that - some people feel they have to do it, but may not be so enthusiastic about wanting to do it, whereas we are excited at jumping in! It is interesting how this same discussion fits into a past people group we were a part of - the reasons some people home school. We chose to home school because it was something we wanted to do, but we met many home schooling families that were doing it because they felt they had to do it as it was the best option for their children even though they did not particularly want to do it. HOW we do it: Some people camp with the bare minimum of supplies, they want the survival experience. At the other extreme, RV enthusiasts can purchase a $200,000 motor home and then hire a professional decorator to do a make-over before heading out on the open road. Likewise, some people move off grid by setting up camp on empty property and then, over time - often years, work at building shelter and slowly improving their 'quality' of off grid life. At the other end of the spectrum, people can hire companies that construct complete, state of the art, off grid compounds so that there is no work required of them prior to moving in. The item at the energy fair which got me thinking of this analogy is pictured to the right. 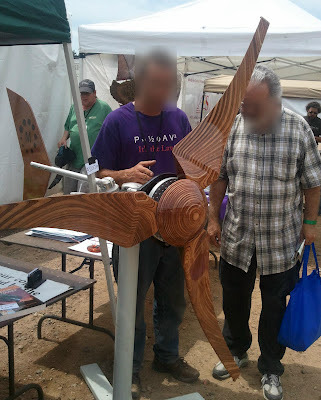 It is a beautiful, highly polished, wooden blade assembly for a wind turbine. When I saw it my first thought was 'What is the purpose of it? It will be dozens of feet off the ground so who would even be able to see it to appreciate it?' This definitely falls into the professionally decorated RV scenario. 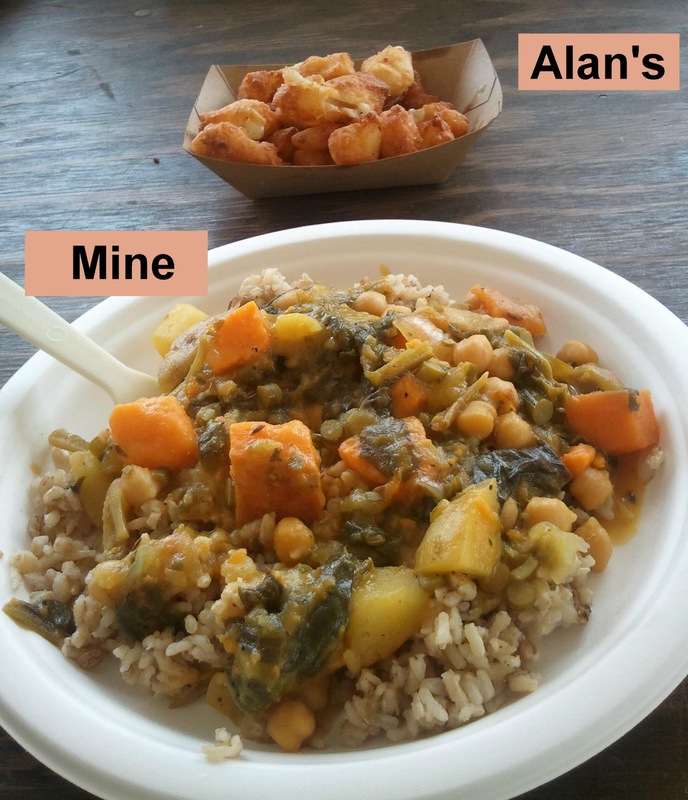 Alan and I fall somewhere in the middle of the two extremes on how to live off grid. We have done minimalist camping vacations in the past (distant past) and have enjoyed it because that was the goal of the experience. We have also rented high-end vacation homes and enjoyed the experience because we had different goals at those times. If we were choosing these vacation accommodations simply based on how much money we could save, we would always be camping in a tent. The same with off grid living, in that if we were doing it to save money, we would be taking a very minimalist approach - no generating electricity, no rewiring the house, no running indoor plumbing, no wood fired hot tub on the deck!, etc. But, just like someone who buys an RV, saving money is not the goal in this case. A person who purchases an RV realizes that if they calculate what each night spent sleeping in the RV actually costs them based on the initial cost of the RV (ie. $70,000/1000 nights is $70 per night not including gas and campground fees) they will probably never 'break even' when compared to staying in cheap hotels, but they did not buy the RV with the goal of saving money over hotels, they bought it to enjoy the experience. Likewise, if we calculate the cost of generating our own electricity vs. connecting into the grid, we will never break even based on what we are spending to set it up. But, being able to share this adventure with the love of my life - PRICELESS! We have been back in Wisconsin for several weeks and I am definitely ready to head back off grid. Unfortunately, our next trip has been delayed by a week. We had planned on heading back on June 18th, but while we have been back we are working to clear out Alan's parent's house and sell it to close out the estate. As part of the process, we ended up signing up with an estate seller to hold an estate sale June 22 & 23, so we will be in the area a bit longer than we had first planned. It will be nice to have dad's house all cleared out! Watch time fly by or would that be time by fly? We have gotten some 'gizmos & gadgets' in while we have been back, so at least we have some things to play with while we are here. Speaking of gizmos, that reminds me that Alan also seems a bit stir-crazy waiting to head back to the property. He was catching up on one of his favorite web sites, gizmodo.com, and came across a fly powered clock. He was extremely disappointed to discover it is currently only a concept and not available. According to the article "As insects get trapped on its sticky rotating conveyor belt, they're scraped off at one end and drop into the processing chamber to be converted to fuel for a simple digital clock. Apparently eight deceased flies can power it for a full twelve days..." Hmm, I wonder if ticks can be used? I told Alan I was writing this and he said yes, but it takes one tick per second (get it? tick - second). Alan has convinced me of another gadget he needs. This one is at Brookstone.com, we obviously spend a lot more time browsing internet sites when we are not off grid. Alan feels this gadget from Brookstone would save us from having to go under the house to run wires, plumbing, etc. Our house sits on piers about 3 to 4 feet off the ground depending if you are at the front or back of the house. Thus, there is a crawl space under the entire house and it is currently enclosed with plywood. We can only imagine how many spiders and possibly snakes now call this dark space home. We were discussing setting bug bombs off under the house on our next trip, and I thought we could open up a couple corners, set the bug bombs inside the plywood and set them off as neither of us wanted to crawl into the possibly spider infested den to get the canisters to a more centralized location. I am assuming the fog would move into the rest of the space under the house. Alan thinks the Rover App-Controlled Spy Tank with Night Vision would be a better solution, we could attach the canisters and drive them around the entire enclosed area while they spray out their fog. 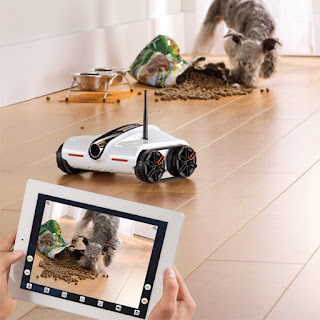 He had already been coming up with other uses for the rover, all involving sending it under the house instead of us. Of course, I am sure the fact that it would be a fun toy never crossed his mind. you build your fire, your cooking pan sits on top of that. 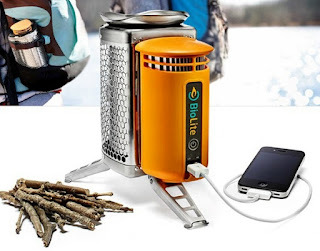 How about a camp stove with a USB port? Yep, now that is really cool. We can charge our phones while heating up water for the French press. Back in December we placed a pre-production order for a BioLite stove (biolitestove.com). It finally arrived this week and was well worth the wait. We are very impressed with the quality of the camp stove and the ingenuity of the design. The concept is that it is a camp stove that does not require a specific fuel and also produces electricity that can be used to charge cell phones and other devices through a USB port. You start a fire in it with twigs, or whatever you have available that will burn. The stove converts heat from the fire into electricity which powers a fan that in-turn makes the fire super-efficient, allowing it to burn most any type of fuel source (this design is known as a Rocket Stove). 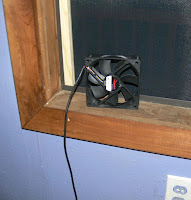 There is excess power not utilized by the fan that is accessible through the USB port to charge devices. The company does make a larger 'HomeStove' but it is not sold in the United States. Alan's first TEG experiment in the solar oven. filled thermos for cooling the cold side of the TEG. The hot side got to 300° while the cold was at 77°. The BioLite CampStove actually uses another gadget in its design that we just started experimenting with. It is called a TEG (Thermoelectric Generator) and the one we ordered to experiment with also arrived this week. A TEG module is about 3 inches square and generates the same amount of electricity as one of our solar panels which is about 1 foot by 2.5 feet in size. You may be familiar with the small travel size coolers that plug into the cigarette lighter on your car, those work based on passing electricity through two dis-similar metals that causes one side to become cold and the other to become hot. The TEG is the antithesis of this. It has two dis-similar metals and when one is heated and the other is cooled it produces electricity. When we received the one we ordered for testing, Alan placed one side in cold water and heated the other side with the torch and it produced enough electricity to easily light one of our large LED light bulbs (Alan will post a blog entry in the future that discusses his investigation of efficient lighting). 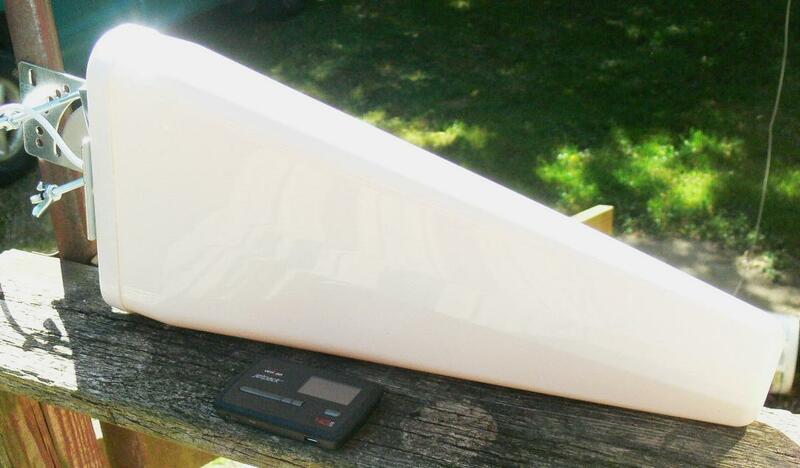 The arrival of the TEG module also leads into a gadget I am anxious to start experimenting with - our solar oven. Alan is currently experimenting with the combination of the TEG and the solar oven, but when the solar oven gets down to the property, then I am going to start experimenting with its intended purpose - cooking. We opened the solar oven and 'seasoned' it per the directions. We placed a pan of soapy water it in for a couple hours and then washed down the insides. We were pleased to see the temperature in the oven was up over 300 degrees even without tracking the sun. We plan to build a tracking system (a future blog entry) so that the oven will remain aimed at the sun throughout the day. When we arrived back home, the high gain Yagi cell antenna had arrived and was waiting for us. While our off-grid cellular Internet connection was usable, we had to lock it at 3G speeds. This antenna will optimally provide a signal that is 16 times stronger (every 3dB is a doubling of strength, and this antenna has 11dBi of gain). This antenna will feed our Novatel MiFi Jetpack cellular Internet modem, hopefully allowing us to reliably connect to a weak 4G signal we saw from the property which will provide a much faster connection. Next to arrive were our hand pumps, foot valves, and hosing. Our current plans are to place three of these hand pumps in the house to pump water from the cistern into the kitchen sink, the utility room sink, and the bathroom toilet tank and sink. After working hard to pump the water to its destination, you don't want it running all the way back to the cistern when you stop pumping, so the foot valves (reverse flow valves) hold the water so gravity can't pull it back. These pumps are made by Guzzler and produce 1 gallon per 9 pumps. We still have two weeks until we are back at the property, hopefully our budget can handle us keeping ourselves amused until then.